@housetangaryen Out of curiosity, only now I recalled that Fuca wrote a letter to QL to set free YL, saying she's not suitable for a life in the palace. Why is that QL chose to banish YL to become an attendant at Yuan Ming Garden instead of sending her totally out of the palace and just live as a commoner? My take is that QL is jealous/upset that Empress Fuca didn’t say anything to him in her final letter, everything is abt WYL, what she wanted for her, what she wanted for him to do. That made him even more sad to know the last person she was thinking of before she took her life was not him, but WYL. Neither could he ignore her last words cos his respect and love for her was larger than the hurt he felt reading the letter. So he compromised as well as wanting to preserve some bit of control that he, the Emperor, felt he should have in this matter. But I don’t think at that point, QL sent WYL there cos he had feelings for her and wanted her around. More like a sum of all things that ultimately created a better situation later on for both. When QL sentenced YL to commit suicide, it was obvious that he seriously meant it. I also don't feel at that point, he even thought about his feelings for YL. The grief was too big for him. In fact, during that passed 2 years, I think QL has forgotten about YL. The thing that I am curious about is.... Should QL didn't meet YL again at Yuan Ming Garden and Fuheng came back victorious from the war, would QL finally allow Fuheng to marry YL? I thought about this too... assuming QL does accede to FH's request to marry WYL, I believe WYL will not want to marry FH. 1. Most importantly, her character is such that she doesn't look back. Once she has already decided to cut ties off with FH, after that snow walk, she will stick to her decision and move on. Also FH, I feel, isn't the kinda guy for her. He is like the puppy who will follow her and protect her all the time, but QL is more her equal in terms of intellect and wits. 2. The next issue is ... I can't imagine her being the 2nd wife with Er Qing lording over WYL. FH will be at the war front regularly, and leaving two women at home will result in a major battle all the time. I can't imagine any peace for the House of Fuca and also FH can't divorce Er Qing, so he may just want to go to war all the time rather than stay home Like what Empress Fuca said, there will not be any peace at home. 3. WYL would have turn 25 and be able to leave the palace if QL allows and remembers her existence. So assuming she did, I guess marrying FH or have FH find her once she is out of the palace will be ok too. Then I guess he wouldn't really need QL's blessings or permission either. I was thinking the same way too. Why would FH see the need to ask QL's permission to marry YL if only he needs to wait for a couple of years till she turns 25 and free to leave the palace? As I said earlier, QL already forgotten about her that past 2 years but bringing her up again will trigger something in QL. Hence, even if QL didn't meet YL again until FH's return, but with the mentioning of WYL again, I still doubt QL will allow FH to marry YL even to trade off with his war victory. As De Sheng told YL before, once QL sets his eyes on a woman, he will never fail to have that woman. The only possibility for FH to be able to marry YL is for her to leave the palace quietly after she reached the age of 25 and that is ofc, if only YL willing to be his concubine. In what episode did Desheng tell Yingluo that? Yeah I agree with you both. Highly doubt Yingluo would want to be a concubine and in this case 2nd to Erqing. - she became imperial noble consort at age 38/39? It didnt seem like yingluo served as a lady in waiting for that long. Or am I wrong? oooh and. Ive noticed that compare to other consorts, Yingluo wears a lot of blue outfits. Wonder why is that. Do you guys think there is any meaning behind this? Cause from what ive noticed when empress fuca was alive, she wore lighter/pastel colors compared to step-empress. Gao Guifei also wore more vibrant colors compared to Noble Consort Chun and Yingluo. @lyserose In my opinion I don't think QL will allow Fuheng to marry YL even after 2 years. In fact I dont think he will even release YL out of the forbidden city. QL is a smart and proud man. For YL to have rejected him the first time in the snow (where YL pretend she would be willing to serve him provided she is given a status), QL would have later figure out that YL is not that kind of women, but yet he know that he has been rejected. Being a proud man, I suspect at that point he was willing to allow her to continue as maid but not leave his sight. Remember when QL was drunk and went to visit Fuca, QL saw YL and told her that even in his dreams he dreamed of her face. He also mentioned that he doubt anybody would want to marry her and as such he will have to feed her forever. Again, I suspect at that point QL was not willing to let YL go emotionally. 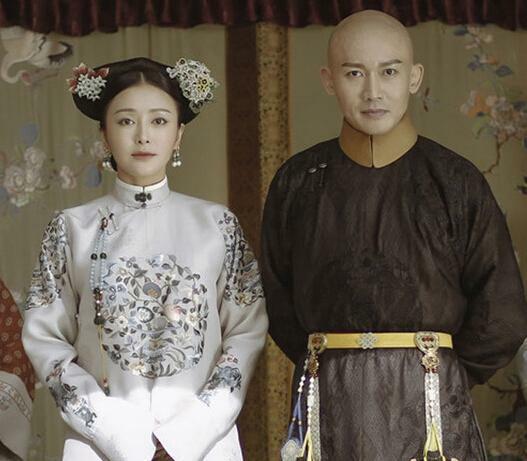 So all in all, if YL did not become QL's concubine, QL will perhaps allow her to stay forever in Yuan Ming Yuan in which he can still see her but he will not release her out of the palace or grant her to marry Fuheng. Aside to that, I link the above to their later stage, since QL's pride was at stake, even after YL became his consort he was reluctant to be the one to make the first move on her, perhaps in away he is afraid that his feelings will not be reciprocated. So when YL became his concubine he avoided her for sometime. And thus, that also leave QL to ponder for a long time - wondering if YL have any feelings for him. 2nd time Qianlong got rejected was when he tried to force her to sleep with him like @heychumi mentioned above. 3rd time is at Yuan Ming Garden after Yingluo was promoted to Wei Guiren. Qianlong ordered her to serve him that night, but our Yingluo show up in a mourning dress, thus he released her. @ChloeR DS said that in episode 27 where he also told YL about lightning warning. YL told DS that the thing (QL's offer to her) is not as straight forward as he thought. Yes, I also noticed she always wear blue. I predicted it has something to do with her male-dominant character since she is not typically feminine type. It was only in later episodes, where YL already become a Gui Fei when she and QL have found peace and comfort in their relationship that I noticed YL always wearing pastel colour like Fuca. Among all YL's dress, I love the deep blue dress with an embroidery at the center that she wore during the confrontation regarding Yongqi's poisoning. I also noticed QL also have 2 or 3 sets of costumes for each period in this drama. Of all his wardrobe, I like him wearing the turquoise robe with dragons embroideries that he wore on the night he summoned YL to sleep with him at Yuan Ming Garden. Regarding the timeline, it's a little inaccurate. SE was right when she mentioned about 24 years since YL entered the palace. Historically, Consort Ling was 38 years old when she became a Huang Gui Fei. The timeline that is inaccurate is where YL became QL's concubine. In history, 18 years old Consort Ling was made a Noble Lady (Gui Ren) when Fuca was still alive. She was even promoted to an Imperial Concubine (Pin) the very same year. Did you noticed that that YL only ever donned her imperial formal wear once in the scene of Er Qing's death but she did get to wear the ceremonial dress of a Huang Gui Fei in the final episode. In contrast, Fuca never get to wear the Empress' ceremonial dress but she did wore the imperial formal wear several times (QL's birthday, her birthday etc). Maybe he was still traumatized by that experience in episode 37, where she was already dolled up as his concubine yet rejected him in the sneakiest way possible. QL surely was scared that YL may make a fool out of him again. It was obvious when he glanced at his concubines' name plates. He wanted to see for himself to assure the fact that yes, she is his concubine for real, now, finally! His facial expression at that moment was priceless. I think I read somewhere the colours represented their rankings. Blue was the lowest rank and yellow colour which Empress Ulara worn was for Empress. My favourites for YL was the dark blue dress she worn when she and QL got back together after a Chen Bi and the beige one with beautiful embroidery in the esp when YL went to massage QL after 5th Prince was injured. And yes my favourite for QL was the turquoise robe. Wonder why he never worn it again. The colour is very striking!!! They really played with the timelines (not as much as other shows, thankfully) but for the most part, everything lines up with historical events. One thing I wish they had done was gave more indicators as to how much time had passed because sometimes a scene would happen and it'd be months later when I thought maybe just a few days had passed. I don't know if there are historical meanings behind YL and blue, but they did have certain colors for each of the consorts and YL's ended up being blue a lot. I also love @lyserose's observation that when YL and QL settled into their marriage, her colors ended up being more pastel and soft like Fuca's. I never put that together and I LOVE IT! (Shameless self promotion time) I have a blog at http://yanxicaps.tumblr.com where I just post screencaps of pretty things from the show, but I have a special costumes tag that has a lot of my favorite outfit changes throughout the show (I haven't gone through the entire show yet) if you guys wanna take a look at it. My favorite blue outfit of YL's is probably the deep blue one she wears in 52 and later on in... 57? I came across this article (the grammar/vocab/sentence structure feels abit weird, possibly since it's an article written by a Chinese company). It describes the use of the Morandi colour palette in the various outfits worn by the actors and actresses in Yanxi. Thought it is pretty interesting, that the shades are subtle and gives off a regal overall look. @sharonfu18 Is this the QL's turquoise gown that you mentioned? For Empress Fuca, I really like this cream one. Love the embroidery, especially when the camera does the closeup. I think the way the characters, eg Step Empress, became more and more evil, the colours that she wore tend to be darker. However at Ep 70 when she was stripped off all her titles and "imprisoned" in her palace after the fallout on the royal ship, she went back to wearing her original shade of light pastel that she wore in the first few episodes. This I guess showed how she didn't hold anymore grudges and just accepted her situation. My favorite outfits are the gold one of Empress Fuca and The one Yingluo wore during the royal entourage. The color and embroidery for those two are so beautiful. I definitely love Qianlong in his yellow robes. Actually I love all his outfits for this drama except those that have a vest on the outside. High Fives @sharonfu18 @believed @housetangaryen We all love the same dress on YL - the deep solid blue with minimal golden embroideries. The colour just pops on YL. @sharonfu18 Is this﻿ the QL's turquoise gown that you mentioned? Yes. This one. I think he only wore this twice. Once during the ceremony at Yuan Ming Garden and once after the Worshipping of Silkworm Goddess Ceremony. I think he wore that robe under his imperial formal robe. @believed Thanks for the blog. I visited it last night and downloaded so many photos for me to put on my desktop wallpaper. Please put more photos of QL and YL. Thanks in advance. I wish I could dye my hair with those hues but my job won't allow me to do so. Now, I am working on the gradient lips the ladies were styled in this drama (and in actual Qing period). Alas, still could hardly get the look. In the scene where YL send YCW to SE after her fellout with QL, she congratulated SE and said a crown prince is going to be born in Forbidden City in nearest time. When YL said that, I could feel she was hurt knowing QL took favour on SE during that period. Also, she does sound jealous, not for the possibility that she's carrying QL's baby but more because QL no longer by her side. And I know Consort Shu was meant for a comic relief but I couldn't picture her impregnated by QL. LOL. I'll try! I'm slowing making my way back through the series, depending on speed of subtitles, but I'm always rewatching the later episodes (which is why I'm always coming back with more questions about translation) so you'll definitely see more pictures of them. Thank you!!!! I love doing it because everything is so beautiful! Glued to ep 20-23 they got subbed on ytube Plus 43 One thing i really really love about YL is she has her own truth meter so precise and accurate that she does not fall for anyones bs . In the ep 23 when CG presented her with Fuheng's belt , she kind of consulted her own intuition and belief again ...gave him s...t mind you , but trusted that he did not do it. Would you believe me if i told you until last year i have never watched a c-drama. It started with our You Wen Yue which led me to Ye Hua which led me to Mai Changsu , which led me Zhangsun Wuji and how i ended up watching Yingluo is a mystery to me too...but even without subs i persisted to the end 70 because i find her fascinating and hilarious ...one tough SiStar . So i keep checking for subs on daily basis when i sign on my computer. But i always read soompi comments on Yan Xi's Palace and when you guys discuss something, and especially if you mention what episode, i would go and re watch that episode since your comments would give me additional understanding even without subs. Again, thanks to some comment above, i went back to check ep43 and to my surprise it was subbed , so of course i had to share .